Posted by Ada Wang on 11/26/2018 4:07:45 PM. 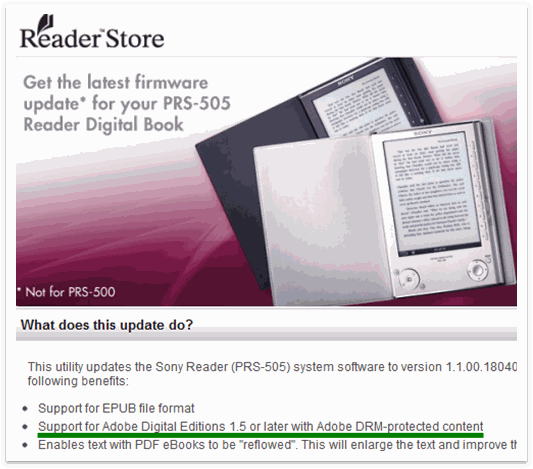 Most of the eBooks purchased from Sony, Kobo or other eBook stores are protected by Adobe DRM. In general, we read these books on dedicated eReaders, but sometimes we need to read them on computers. Apart from official reading software such as Sony for PC/Mac or Kobo for PC/Mac, Sony/Kobo books can be read on ADE(Adobe Digital Editions) as well. As official site shows, Sony and Kobo books are supported on ADE. Reading Adobe DRM-protected books from Sony and Kobo requires different methods. Here are two parts to introduce how to read Sony and Kobo books separately. 1Download and install Adobe Digital Editions. 2 Authorize your computer with your Adobe ID on the “Setup Assistant” screen. Click “get an Adobe ID online” if you don’t have one. 3 Add Sony books. Click “Library” item and select “Add Item to Library”. Select an EPUB book from Sony folder. The default path is: Libraries/My Documents/My Books/Reader. Make sure you can read the book on ADE. If your Sony book cannot be opened on ADE, it might be downloaded from a device that is not authorized with the same Adobe ID. You need to authorize device with your Adobe ID and redownload the book to your computer. How to authorize your Sony for PC? Select “Help” menu on the top menu bar. Select ”Reader Help”. 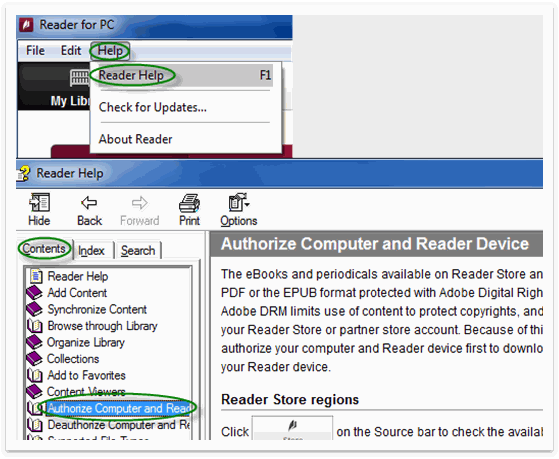 On the pop-up Reader Help file, select “Contents” / “Authorize Computer and Reader Device”. You can follow the guide to authorize your computer. 1 Sign in at Kobo’s official site. 2 Click “MY LIBRARY” on the top navigation bar. 3 Click “ADOBE DRM EPUB” on the right side of your book and an ACSM file will be downloaded to your computer. 4 Drag the ACSM file to ADE. Or right-click the ACSM file and select "Open with" -> "Adobe Digital Editions". The EPUB book will be downloaded to your computer during this process. 1. To get the downloaded EPUB book path, click the triangle button on the left side of the book. Select “Item Info” and you will see the "File path". 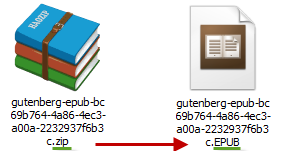 The EPUB book is saved in the default path: .../Documents/My Digital Editions. 2. 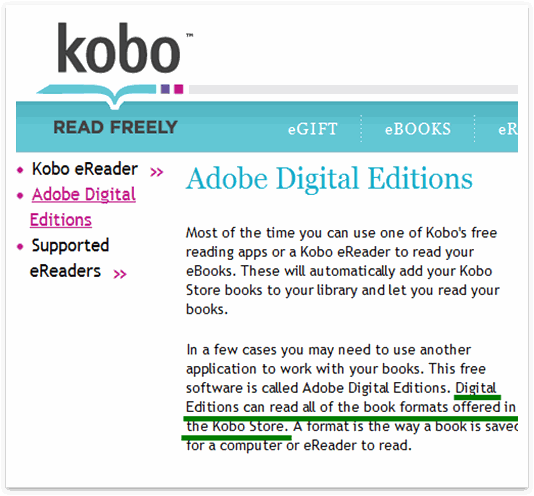 If your ADE cannot open your Kobo books, please make sure your Kobo software/device and ADE are authorized with the same Adobe ID (same email address). 3. If there is "DOWNLOAD EPUB" instead "ADOBE DRM EPUB" button in step 3, click "DOWNLOAD EPUB" to download the EPUB book to your computer. If the downloaded Kobo book is ZIP file, simply rename the extension name ".zip" to ".epub". Right-click the EPUB file to select "Open with" Adobe Digital Editions. 4. Kobo has changed their DRM scheme after Kobo 3.19, all downloaded Kobo books will be KEPUB format, not the adobe supported ePub or PDF. Read this article Kobo DRM Removal to know more. We have pointed out for many times that you should authorize Adobe Digital Editions with your Adobe ID and make sure you can open & read your books on ADE before removing DRM. That results from such a fact that Adobe DRM encryption is exactly based on user's Adobe ID, and vice versa, DRM removing program has to grab the correct Adobe ID and generate decrypting key so as to remove DRM smoothly. If the authorized ADE cannot open DRM-protected eBooks, the Adobe ID being used must disagree with the one which was used to encrypt your eBooks. Thus our program, which just generated decrypting key according to that wrong Adobe ID, will fail to decrypt your eBooks. Read Kindle books on Nook, Sony, Kobo, etc. I had already installed ADE, and had the Sony synced with it, my computer and the reader. It still is saying no files to decrypt, it is only pulling the welcome to ADE, so it is reading something. Now I have bought this program and it isn't working. I still want it but I want it to work, I have a lot of books that I want to transfer to my new Kindle. We've sent an email to you, please check! I installed ADE and Kobo Desktop on my Mac (0S 10.10). I'm using the same account ID for both. Error while getting the license. Communication issue with license server : E_ACT_NOT_READY"